Built by Bell in Buffalo, New York. Constructors Number 26E-397. Delivered to the U.S. Army. Disassembled and shipped overseas and reassembled. Assigned 5th Air Force, 71st Tactical Reconnaissance Group, 87th Tactical Reconnaissance Squadron. Assigned to pilot Peter A. McDermott, who nicknamed it "Brooklyn Bum 2nd". Crew chief James W. O'Mara and armorer Sgt John M. Conway. On the left side of the cockpit was painted the nickname, pilot's name: 'Peter A. McDermott' and nine bomb markings. Also, a shamrock and horseshoe artwork on the cockpit door. On the right engine cowl was "Oswego, NY". This Airacobra had a white tail and white leading edges of the wings. This aircraft operated from New Guinea and was abandoned at Tadji Airfield. 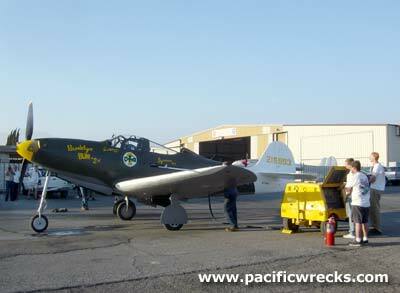 Officially, this Airacobra was stricken from charge on May 21, 1945. Remained 'in situ' at Tadji Airfield until the early 1970s, with the propeller removed and armament missing. Recovered by Charles Darby and Monty Armstrong from Tadji in 1974 during the salvage operation for Yesterday's Air Force (MARC). Transported to New Zealand and stored by Monty Armstrong in Auckland, from 1974-1976. Sold to the Australian Aerospace Museum, Melbourne, Victoria where it was restored to static display as "Brooklyn Bum 2nd" from 1982-1988. Next, displayed at Air World in 1989. Next, the aircraft was sold to Don Whittington in Florida, who owned it from 1989 - 1991. Afterwards, sold to the Santa Monica Museum of Flying where it was displayed from 1992 - 1994. While on display, it was painted with yellow colored tail and leading edge of wings, instead of white. 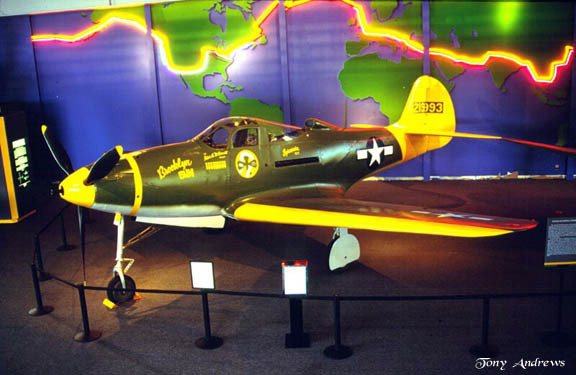 When that museum disbanded, it was sold to The Fighter Collection, but first sent to the Fighter Rebuilders / Planes of Fame for restoration to airworthy condition. At Fighter rebuilders, it was under restoration from 1994 - 2004. Registered as N793QG June 10, 2004 (this registration was canceled on February 16, 2007. The aircraft preformed engine tests and its first flight piloted by by Steve Hinton on June 18, 2004 at Chino Airport, while the restoration staff at Fighter Rebuilders watched their project fly.